EDR Fittings is a company with more than 15 years experience in solutions for industries producing lost wax investment casting of high quality. This experience has allowed us to become partner of leading Italian and European companies. Countless audits of Asian industries (China, Taiwan, India, Thailand) have allowed us to be able to provide products of highest quality with more competitive costs on the market. 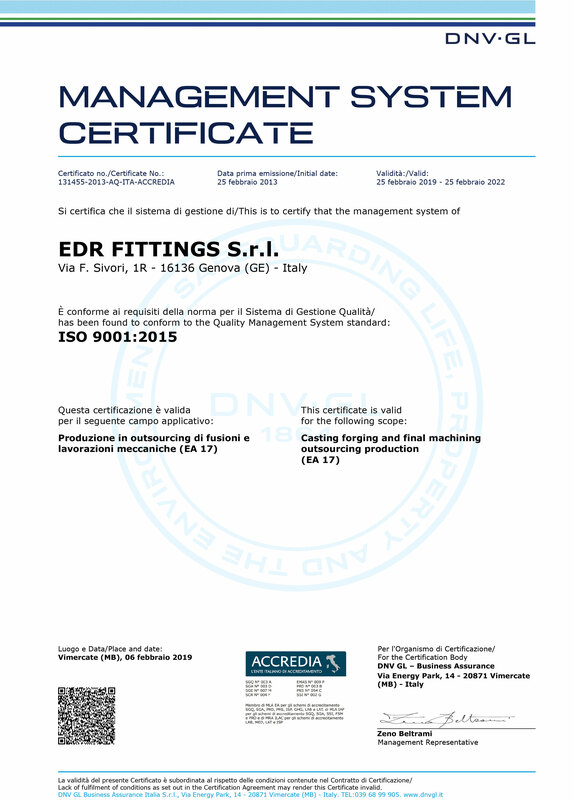 EDR Fittings, in addition to the Italian structure, is also present in China (Wenzhou) with a technical staff and skilled personnel to follow step by step all the production processes. .
DNV is an important notified body that provides certification for business management systems for quality, environment, safety and product certification. Internationally recognized Reference Certification for the Quality management of companies like ours that want to respond to the increasing markets competitiveness through the improvement of customer satisfactionand loyalty, the streamlining of internal processes and the consequent reduction of waste and inefficiency.